The 2012 ADRL Tour will come to an incredible conclusion at this weekend's ADRL World Finals VIII presented by CarSafe at the Texas Motorplex, and there are plenty of world championship races to be decided. Here are the world championship scenarios in each class. These scenarios all factor in the points leaders in every class participating this weekend at the ADRL World Finals VIII presented by CarSafe at the Texas Motorplex. This is going to be a brilliant battle between teammates Mick Snyder and Jason Scruggs. Both have won three events this season and Snyder currently leads Scruggs by a mere six points, which means there will be plenty of excitement before the 2012 world champion can be crowned in Pro Extreme. With such a close points race, there are plenty of ways for both to win. 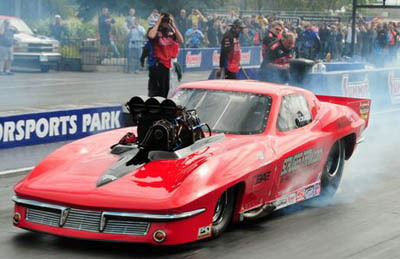 It would be the first ADRL world championship for Snyder, and the third for Scruggs. If Scruggs doesn't qualify. If Snyder wins and Scruggs doesn't finish as the runner-up, set both world records during the day and qualify seven spots or better. Advancing to the same round as Scruggs and not finishing seven spots or worse in qualifying. Losing a round earlier than Scruggs, but setting both ends of the world record and not qualifying seven spots or worse. In this scenario, Scruggs could only advance one more round than Snyder (second round if Snyder loses in first, semifinals if Snyder loses in the second, runner-up if Snyder loses in the semifinals, champion if Snyder finishes as runner-up). If Scruggs wins and Snyder doesn't finish as the runner-up, set both world records and qualifying seven spots or better. Advancing to the same round as Snyder and finishing seven spots or better in qualifying. 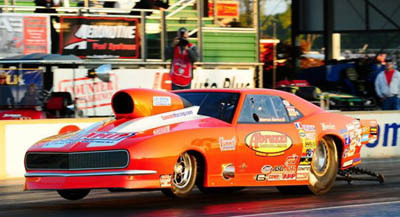 After a spectacular 2012 season, Bob Rahaim is on the verge of his first ADRL world championship. In fact, after going to five finals and winning three races, including the last two, the scenario is pretty simple for Rahaim. To clinch the Pro Nitrous championship, Rahaim simply has to show up and have his car pass tech and he clinches the world championship. Currently, Rahaim leads Doug Riesterer by 453 points. But Rahaim will have competed in all 10 events when he shows up in Dallas, while Riesterer missed one race. It means only Rahaim is in line to earn the 250 bonus points that goes to all ADRL competitors who attend all 10 events. That takes the lead to 703 points, which is more than the maximum 641 points that can be earned at one ADRL event (500 points for event win, 100 points for E.T. and speed world records, and 16 points to qualify No. 1). Thus, when Rahaim shows up in Dallas, the championship is his and the celebration will begin. Alan Pittman is closing in on his first ADRL championship as well and currently leads Billy Glidden by 603 points, thanks in part to three event victories in 2012 in the Mickey Thompson Extreme 10.5 class. If it is an 8-car qualifying field, as it has been for every race during the 2012 season, then all Pittman has to do is show up in Dallas and have his car pass tech. If it is a 16-car qualifying field, Glidden would need one of the best performances in ADRL history to pull off the massive upset. Even if it is a 16-car field, all Pittman would have to do is qualify to ensure the championship. 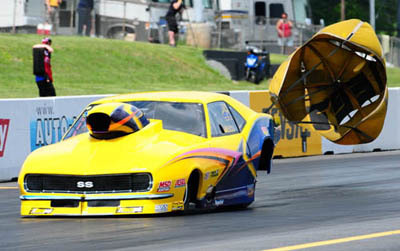 The only way for Glidden to win is for Pittman to not qualify, Glidden win the race, set two world records in the process and earn four or more qualifying points. A dominant season by Eric McKinney means the world championship is already his. McKinney has won six races, including the last four, advanced to eight finals and put together one of the best seasons in ADRL history. He would like to cap it off with one more win, but the world championship is already there for him to enjoy. Like he was last year headed to Dallas, Cary Goforth is the odds-on favorite to win the XPS championship for the second straight year, which would put him alongside Jason Scruggs as the only two ADRL competitors to win back-to-back titles. But Goforth, who holds a 435-point lead against Richie Stevens and 539 points against Brian Gahm, will have some work to do to ensure the championship. The easiest way to for Goforth to clinch another world championship is to simply qualify and win a first-round matchup, mathematically eliminating both Stevens and Gahm. If he qualifies but loses in the first round, there are a number of ways for both Stevens and Gahm to slip past him. Winning the race and Goforth not qualifying. Advancing to the final and setting at least one world record, and Goforth not qualifying, and Gahm not winning the race, setting a world record and qualifying four spots better than Stevens. Advancing to the final and setting both world records, and Goforth not qualifying. Winning the race, setting one world record, earning two or more qualifying points, and Goforth losing in the first round. Winning the race, setting both world records and Goforth losing in the first round. Winning the race, setting one end of a world record, Goforth not qualifying, and Stevens not finishing as the runner-up, setting the other end of a world record and qualifying four spots or worse than Gahm. Winning the race, setting both ends of the world record and Goforth not qualifying. This is the first full year for the Aeromotive Fuel Systems class and this one will go down to the wire, with Jeff Naiser, Mike Castellana and Pat Musi all having a chance to win. When the 250 bonus points are factored in, it is actually Naiser and his 2,117 points leading the way, with Castellana 129 points behind (1,988) and Musi 150 behind (1,967). That means it's going to be an exciting weekend in Dallas. Obviously, if Naiser wins the race, he wins the championship, but there are plenty of scenarios for each driver to win a championship. Remember, this is an 8-car qualifying field, meaning the most you can win for an event victory is 400 points (300 for runner-up, 200 for semifinal berth and 100 for qualifying). If he finishes as runner-up and Castellana doesn't win and set one world record, or Musi doesn't win, set one world record and qualify one place higher than Naiser, or win and set both world records. If he finishes as runner-up and sets at least one world record. If he advances to semifinals and Castellana doesn't win the race or finish as the runner-up and set one world record, and Musi doesn't win the race. If he advances to the semifinals, sets one world record and Castellana or Musi don't win the race. If he advances to the semifinals and sets two world records. If he loses in the first round and Castellana doesn't advance to the semifinals and set one world record, or advance to at least the finals without a world record. In this scenario, Musi cannot advance to the semifinals, set a world record and qualify one place higher than Naiser, or advance to at least the finals without a world record. If he loses in the first round, sets one world record and Castellana doesn't advance to the finals, and Musi doesn't advance to the finals. If he loses in the first round, sets both world records and Castellana or Musi don't win the race. If Naiser doesn't qualify, he can still win the championship if both Castellana and Musi lose in the first record and don't set a world record. If he wins the race and Naiser doesn't finish as runner-up or advance to the semis and set both world records. If he wins the race and sets at least one world record, and Naiser doesn't finish as the runner-up and set a world record. If he wins the race and sets both ends of the world record. If he finishes as the runner-up and Naiser loses in the first round and doesn't set two world records, and Musi doesn't win the race. If he finishes as the runner-up, sets one world record, and Naiser doesn't win, and Musi doesn't win and set one world record. If he finishes as the runner-up, sets two world records and Naiser doesn't win the race. If he advances to the semifinals, Naiser doesn't qualify and Musi doesn't finish as runner-up, or advance to semifinals and not set one world record. If he advances to the semifinals, sets one world record and Naiser loses in the first round and doesn't set a record, and Musi doesn't advance to the finals. If he advances to the semifinals, sets two world records and Naiser loses in the first round, and Musi doesn't win the race. If he loses in the first round and sets one world record, and Naiser doesn't qualify, and Musi doesn't advance to the semifinals. If he loses in the first round and sets two world records, and Naiser doesn't qualify, and Musi doesn't advance to the finals. If he wins the race and Naiser doesn't finish as runner-up or advance to the semis and set both world records, and Castellana doesn't finish as runner-up and set both world records. If he wins the race, sets one world record and Naiser doesn't finish as the runner-up and qualify higher or set a world record. If he finishes as the runner-up, and Naiser doesn't advance to the semifinal or lose in the first round and set both world records, and Castellana doesn't win or advance to the semifinals and set both world records. If he finishes as the runner-up, sets one world record and Naiser doesn't win or advance to the semifinals, set one world record and finish one qualifying spot better than Musi, and Castellana doesn't win. If he finishes as the runner-up, sets two world records, and Naiser and Castellana don't win. If he advances to the semifinals, Naiser doesn't qualify, and Castellana doesn't advance to the semifinals or lose in the first round and set both ends of the world record. If he advances to the semifinals, sets one world record, Naiser doesn't qualify, and Castellana doesn't advance to the finals or advance to the semifinals and set one world record. If he advances to the semifinals, sets two world records and Naiser doesn't advance to the semifinals and Castellana doesn't advance to the finals. If he loses in the first round and sets one world record, and Naiser doesn't qualify, and Castellana doesn't advance to the semifinals or lose in the first round and set one world record. If he loses in the first round and sets two world records, and Naiser doesn't qualify, Castellana doesn't advance to the semifinals. 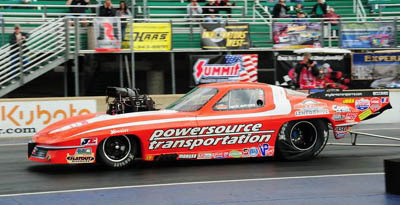 The first full season of Summit Racing Equipment Top Sportsman has provided some of the most exciting moments of the 2012 season and it could turn into the best points race of the weekend. Currently, Marco Abruzzi and his two event wins have 2,679 points, which is 208 more than William Brown III and 340 more than Ronnie Davis. At 563 points back, Chuck Mohn is also mathematically alive. If Abruzzi wins the race or finishes as the runner-up, he gains his first ADRL world championship, but there are numerous other scenarios that spell out championships for each driver. If he advances to the semifinals and Brown doesn't win the race and set both world records. If he advances to the second round and Brown doesn't win the race or advance to the finals and set both world records, and Davis doesn't win the race, set one world record and qualify 10 spots better, or set both world records. If he advances to the second round and sets one world record and Brown doesn't win the race and set one world record. If he advances to the second round and sets both world records. If he loses in the first round, and Brown doesn't advance to the final or advance to the semifinals and set both world records, and Davis doesn't win the race or advance to the finals, set one world record and qualify 11 spots better, or set both world records. If he loses in the first round and sets one world record, and Brown doesn't win or advance to the final and set one world record, and Davis doesn't win and qualify 10 spots better, or win and set one world record. If he loses in the first round and sets two world records, and Brown wins the race. Winning the race and Abruzzi not advancing to the second round and setting a world record. Winning the race, setting one world record and Abruzzi not advancing to the semifinals. Winning the race, setting both world records and Abruzzi not advancing to the finals. If he finishes as the runner-up, and Abruzzi loses in the first round and doesn't set a record, and Davis doesn't win the race. If he finishes as the runner-up, sets one world record, and Abruzzi loses in the first round, and Davis doesn't win the race and set a record. If he finishes as the runner-up, sets both world records and Abruzzi doesn't advance to the semifinals. If he advances to the semifinals, and Abruzzi doesn't qualify, and Davis doesn't advance to the finals, or doesn't advance to the semifinals, set one record and qualify 12 spots or better, or set both world records. If he advances to the semifinals, sets one world record, and Abruzzi doesn't qualify, and Davis doesn't advance to the finals, qualify 12 spots or better, or set a world record. If he advances to the semifinals, set both world records, Abruzzi doesn't advance to the second round and Davis doesn't win the race. If he advances to the second round, sets both world records and Abruzzi doesn't qualify and Davis doesn't advance to the finals. If he wins the race, and Abruzzi loses in the first round, sets one record and doesn't qualify 11 spots better, or doesn't set both ends of the world record, and Brown doesn't advance to the final and set one world record. If he wins the race, sets one world record and Abruzzi loses in the second round and doesn't qualify 11 spots or better, or doesn't set one world record, and Brown doesn't win the race. If he wins the races, sets both world records and Abruzzi doesn't advances to the semifinals. If he finishes as the runner-up and Abruzzi doesn't qualify, and Brown doesn't win, or advance to the semifinals, set one world record and qualify 13 spots or better, or set both world records. If he finishes as the runner-up, sets one world record and Abruzzi loses in the first round and doesn't qualify 11 spots or better, and Brown doesn't win the race. If he finishes as the runner-up, sets both world records, and Abruzzi loses in the first round, and Brown doesn't win the race. If he advances to the semifinals, sets one world record, and Abruzzi doesn't qualify, and Brown doesn't advance to the semifinals and qualify 13 spots or better, or set a world record. If he advances to the semifinals, sets both world records, and Abruzzi doesn't qualify and Brown doesn't advance to the finals. The only way Chuck Mohn can win is if he wins the race, sets both ends of the world record, Abruzzi doesn't qualify and both Brown and Davis don't advance past the semifinals. Alexander Oppen currently leads Jackson Core by 303 points. But Oppen has attended all 10 races, while Core has not, putting only Oppen in line to earn the 250 bonus points for participation. With this, the lead grows to 553 points, meaning all Oppen has to do is show up in Dallas and have his dragster pass tech to claim his first ADRL world championship.